On the left is the straight 8. 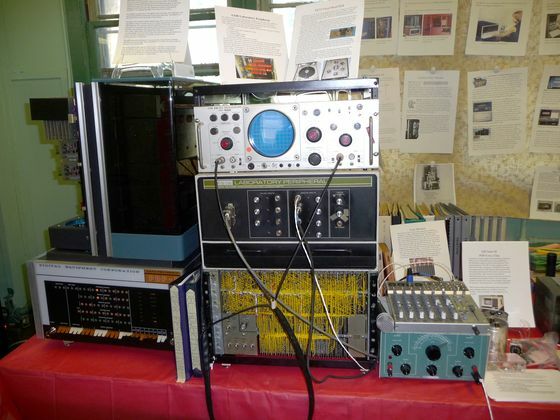 To the right from top to bottom is a Tektronix RM503 oscilloscope / monitor for AX08, AX08 laboratory peripheral, and DF32 disk drive. To the right of the rack is a Heathkit EUW-27 signal generator I used as input to the AX08 and a mixer for the microphone. The back wall has information signs for the display. The left cover is off the PDP-8 to people can see the cards.